This article focuses on local search and the steps that websites need to take in order to get better rankings. Google is used over 6 billion times a month for local search and these steps are instructive for manufacturers trying to better improve their rankings on a regional or national basis. The prescriptions are here for success using Knowledge Graphs and reviews for any website. The local market dramatizes the competitive marketplace for local business. It is important that your website provides the feature that Google is rewarding in website rankings. As an Internet professional, you know that answer is complicated and lengthy, and can’t all be covered in passing. That’s the reality of where many local businesses are starting though. They know Google is important, and they may have even set up AdWords or Places accounts but have no idea where to go from there. Luckily, the local businesses that have opened their doors in the last couple years seem way more advanced than those who came before them (and are just now launching a digital presence long after they framed their first dollar). Google’s affinity toward local businesses should be obvious, as it practically rewards companies that publish NAP info (name, address, phone). For Google, it’s just smart business. What Google found in its May 2014 report, “Understanding Consumers’ Local Search Behavior,” backs up its theory that consumers search with their location and proximity in mind. In fact, Google found that four in five consumers use search engines to find local information. What’s more, 50 percent of consumers who conducted local searches on their smartphones visited stores within one day and 34 percent who searched on computers/tablets did the same. Those are figures that Google can take to the bank because local searchers take action and businesses are willing to pay to get in front of this ready-to-buy audience. Local businesses that have used Google Places for Business or the Google+ Pages dashboard to manage company information were automatically upgraded in mid-June to the Google My Business dashboard. The platform aims to make it simpler to manage local business information so customers can find brands across Google properties, including on Google Maps, Google Search and Google+. Learn how to accelerate your success with Google My Business at wsm.co/gmybiz. Users who are searching for local information have different needs than someone looking to, say, shop online. Four in five consumers from Google’s report indicated they want ads customized to their city, zip code or immediate surroundings, but the device itself is equally important. Draw “zones” around where your prospective users live, work and play to maximize conversions by leveraging “geofencing.” Learn how at wsm.cogeofencing101. The difference is that 51 percent of smartphone users are on-the-go searching for local information, while 76 percent of computer/tablet users are researching at home. The questions become how do local business owners make the distinction between users on different devices and what does that mean for ad content? In early 2013 all Google AdWords campaigns became enhanced campaigns, which gives advertisers the ability to reach people with the “right” ads based on their specific location, the time of day and device. For example, a health spa in Chicago could create a campaign to promote its local offline business and its online store. In a single campaign, the owner could create ads with headlines, messages and landing pages that are tailored to customers searching on their mobile devices for spas in Chicago .  At the same time, and in the same campaign, the merchant can create ads that will appeal to people who want to shop for facial creams or body wraps from their desktops, laptops or tablets. One way to deliver different messages to different shoppers is through extensions. Local businesses should utilize ad extensions in order to have more control over the ad appearance and to maximize click throughs and conversions. In a whitepaper on the subject, ChannelAdvisor recommended that every advertiser use sitelinks, which are simply links to specific parts of the advertised website. According to Google, on average, advertisers who use sitelinks have seen their ad click-through rates improve by 30 percent. For example, Ulta uses the sitelinks extension to include a link to their store locator in the paid search ad, which is particularly useful for a mobile searcher (see image below). A local business can visit its AdWords account to see how many clicks and impressions the ad extension has received, its related costs and other metrics to decide which types of ad extensions work best and when it’s time to add or remove an existing ad extension. The goal of sitelinks, according to ChannelAdvisor, is to be very specific. They provide this example. A merchant using keyword destination URLs and whose campaign includes keywords that are quite specific, like “Brand+Item Category+Model Number+ Color” wouldn’t want to include a sitelink that goes back to a Brand+Category page. This is because the consumer made a specific search and the brand would essentially be broadening the query by sending them to the category page instead of the product page, which could result in a higher bounce rate and a lower ROI. When done right, local businesses can expect a dramatic increase in click-through rate and increased conversion rate overall while still being charged the same as a standard cost-per-click text ad. 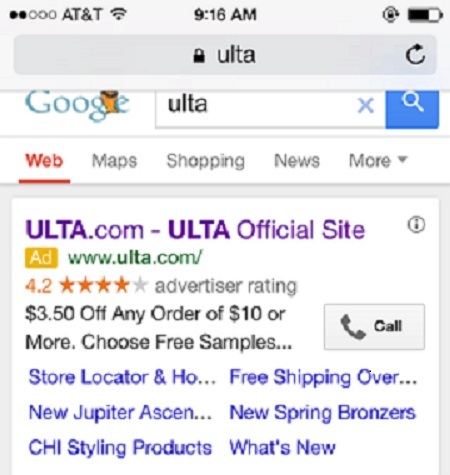 Since we know that 51 percent of smartphone searchers are on-the-go searching for local information, local businesses will also want to utilize the Call Extension (offering click-to-call functionality from the search results) like Ulta did in order to display a clickable phone number within the text ad, which can increase click-through rates and conversions. Along with switching all AdWords advertisers to enhanced campaigns in 2013, Google also redesigned local search results with the introduction of its Carousel format. Essentially, Google Carousel provided a new way to showcase local organic results on Google’s search results pages, according to Adam Dorfman, SVP of product and technology at SIM Partners. Dorfman says the biggest benefit is it allows more businesses to appear above the fold than the traditional seven-pack results (see image). Additionally, when a searcher clicks on one of the results, they are taken to another search results page with information about the business that was clicked on (typically the company’s website, social pages, local listings, etc.). Sure, local directories don’t have the SEO importance they once did, but merchants need to ensure the information they contain is accurate. See how to make list management easier (with the likes of Yext, Moz Local and more) atwsm.co/betterlistings. One drawback, however, is that results are very image-based, and controlling which image is displayed is not currently possible, according to Dorfman. Businesses will want to upload high-resolution images to their Google+ pages to help their companies stand out in Carousel results. Additionally, they’ll want to update contact info, business descriptions, hours, website URLs and more from the new Google My Business dashboard. More recently Google started testing products in Carousel, and it will be interesting to see how its new acquisition of Rangespan, a provider of a product listing management and big data services, will impact how products are displayed both organically and through paid ads. Learn how to optimize your listings before it’s too late at wsm.cogprepared. On the surface Google+ seems like a social wasteland that is scattered with random and inconsistent content, leading many local businesses to quickly abandon their efforts or ignore the social network altogether. But despite Google+’s lack of activity, the social network is actually more important to a business’s digital strategy than some of social’s biggest powerhouses. In fact, having a Google+ profile can help local businesses strengthen their visibility in Google Search. For example, branded searches trigger a company’s Google+ profile (and latest post on the network) to show in the right-hand column of the search results. For this reason and others, overlooking the influence Google+ can have on a company’s visibility is a huge mistake. To reap the rewards of Google+, merchants must begin by optimizing their profiles. For starters, they need to select the “Local Business or Place” category when creating their business profiles, as this will allow their brick-and-mortar locations to show up on Google Maps. Once the location is verified, it is crucial that a merchant fills out every field on the profile, including contact information, website address, hours of operation and business description. It is also important to add categories to the page, as relevant categories will ensure that the business shows up in appropriate search results. Setting up a Google+ Local page, however, is just the beginning of establishing a business presence on the social network. Once pages are created, merchants need to start posting content on a regular basis to help grow their audience base. Similar to social networks like Facebook and Twitter, business owners should aim to post a variety of content that is engaging and tailored to their audience’s interests. Matthew Zajechowski, outreach manager for marketing agency Digital Third Coast, notes that merchants should not underestimate the power of using the hashtag on Google+ to obtain visibility. I think the first important step in going local would be to use locally based hashtags in your posts that include the name of the city your business is located in, along with any other local communities your business serves,” said Zajechowski. Although growing an audience on Google+ may take longer than other social networks, it is definitely worth the time investment. In fact, Chris Long from SEO and Web design company ProFromGo notes that Google+ members are more likely to see content in their personalized search results from the brands they have added to their Circles, a feature that enables Google+ members to sort their followers into specific groups. The right hashtags make a big difference. Everypost created an insightful infographic on the Dos and Don’ts of hashtags on Google+ at wsm.co/ghash14. Long has also found that businesses are capable of ranking with their followers for broad and competitive keywords, all because of Google+. Once a strong presence is established on the social network, merchants can even tailor their content strategies to include keywords they know their followers will search for. Just as consumers add companies to their Google Circles, merchants should spend time growing their Circles too. Since Google Circles allows users to segment people they follow, merchants can leverage this feature to organize people into different groups, like brand advocates or industry influencers. In doing so, merchants can focus on building relationships and interacting with specific groups of people, which can eventually lead to greater visibility and new business opportunities. See what circles every business should create at wsm.co/circlethis. When it comes to engagement features, Google+ offers more than most of its social network competitors. This is good news for local businesses that can leverage these features to better connect with niche audiences and drive brand awareness. In fact, one of the best features for local businesses to take advantage of is Google+ Communities, which enables users to create private or public communities for a specific group of people. For businesses just starting out on Google+, participating in Communities can help them increase visibility and grow their audience base. Shannon Cole of Shannon’s Pet-Sitting, for example, quickly discovered the value Communities has. In addition to participating in niche Communities, local businesses can also create their own Communities to foster better relationships with their most loyal customers. Within its Community, the business can interact with their audience members, spark conversations, market specials and ask for reviews. Actually, one of the best things local businesses can do for themselves on Google+ is obtain reviews, as these pieces of user-generated content can influence rank in the search results. At the risk of sounding repetitive, reviews can also be managed within the new Google My Business dashboard. Jon Clark from Internet marketing company Fuze SEO says that reviews are a big driver behind Google’s local algorithm, and that the frequency of reviews is deemed as an indicator of relevance. Reviews can also help local merchants become a Google Trusted Store, which gives shoppers confidence when doing business with a new company. As of the last holiday season, businesses needed to have at least 30 unique reviews within the past year and an overall rating of at least 3.5 stars to participate. Communities and reviews, however, aren’t the only engagement features that merchants should focus on. Other features worth testing include Google Hangouts and Events. With Hangouts On Air, for example, merchants can create live video broadcasts and host conversations with up to 10 people. Conversely, Google+’s Event feature enables businesses to create and promote events on Google+. This feature is especially useful for brick-and-mortar stores that have the opportunity to merge their online and offline communities by hosting events at their physical stores and inviting their digital customers to attend. Facebook and Twitter meet every Google+ advancement with one of their own. Check out their local offerings at wsm.co/mustuselocal. Google+ may not have the massive audience of Facebook or the real-time intrigue of Twitter, but remember that its user base is still growing and the social network offers many benefits outside of vanity metrics like followers or likes. Businesses should leverage Google My Business to monitor and track notifications and updates, view the top searches for their brands on Google, discover the locations from where customers are getting directions to their businesses from and view Google+ post insights. By analyzing this data, store owners can optimize their marketing and engagement strategies for better performance on the social network over time. After all, the businesses that maintain a presence and interact with other members on the social network will not only be able to develop their following, but will also be rewarded in the search results. As Google continues to dominate the online landscape in terms of how Internet users access information both on the go and at home and work, local businesses should allocate much of their resources to improving their Google presence. After all, it’s a Google world but local businesses can easily learn to thrive in it.